I’m getting so excited about our home office redo, I can’t wait to have more of a workspace. 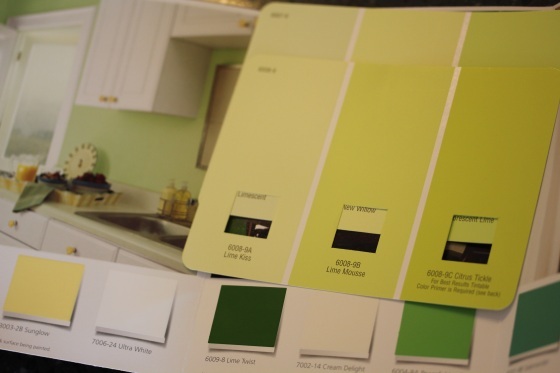 I ran by Home Depot and Lowes at lunch today looking for paint color ideas and fell in love with this Lime Mousse color for the walls. What do you think? Seems like it’ll be perfect with the light wood shelves and desks I’m planning on. I also checked out ceiling fans for the office and found that 99% of them are ugly and over-priced. I finally found one I liked at Home Depot, but most of them looked too cheap and plain or like something a model home threw up, there didn’t seem to be many contemporary happy-medium options. After many high-raw and smoothie dinners, I was craving something I haven’t had in awhile for dinner – lentils! Total comfort food for me after another busy day at work and lonely night at home. I browsed AllRecipes for inspiration and decided to us this recipe as a starting point, but ended up with something pretty different and delicious 45 minutes later. I didn’t feel like rice, but pulled out fava beans from last weeks farm box that needed to be used up, why not throw them into a soup too? And cilantro, green peppers, little potatoes, and a box of dehydrated tomatoes. Heat coconut oil in a large soup pot over medium heat, then saute onions until translucent. Add garlic, potatoes, and veggie bouillon and saute for another 10 minutes. Stir in the rest of the ingredients and simmer over medium heat for 30 minutes. Makes 4 servings. 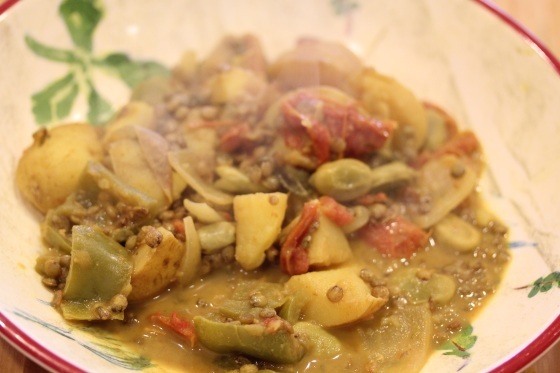 I adore how quick dried lentils cook for weeknights and how versatile they are for bean stews. The flavor was wonderful, rich and creamy with a slight spicy curry kick that went well with the dried tomatoes and coconut oil. Of course you can swap just about any veggie in this recipe, I was just using up what I had in the fridge. The fava beans actually blended well and tenderized nicely simmering in the soup, I didn’t need to remove the out seed shell. An excellent, simple one-pot-meal that left me plenty of leftovers for lunch tomorrow. 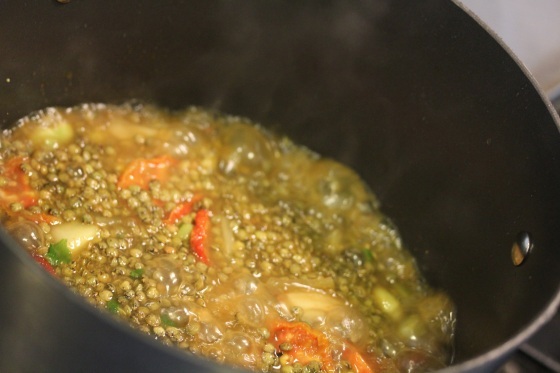 What’s your favorite lentil recipe? fave lentil recipe? yours looks great!!! i make sloppy joes with them that are really good or a curried lentil dish w/ raisins and ginger. and good luck with the home improvement stuff…yes, ceiling fans (and draperies and towels) are some of the most overpriced yet always feel cheap and ugly things going! you really have to search! Home reno projects are so fun!!! I really like that color– very cheery!! Lentils are high on my list of best food ever. 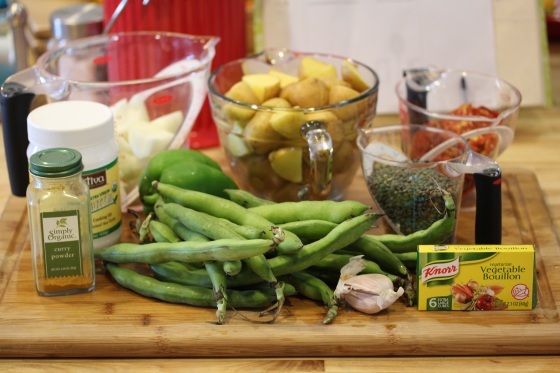 I like your recipe a lot (think how quick those potatoes would cook up in a pressure cooker …. wink, wink. YOUR recipe is next on my lentil list!